The East African Community (EAC) Secretariat is intensifying preparedness efforts against outbreaks of infectious diseases in the region, according to the latest press release. “The world continues to be challenged by public health threats like the current Ebola virus disease outbreak in the Democratic Republic of Congo which are prone to crossing borders and threatening lives and livelihoods and the economy as a whole”, said Frederik Copper of the World Health Organisation (WHO) Headquarters in Geneva at an EAC stakeholder meeting in Nairobi, Kenya. “It was therefore important to exercise, practice and plan to build capacity for better outbreak preparedness and response,” says part of the press release. The stakeholder meeting took place at the International Center for Insect Ecology and Physiology (ICIPE) on October 11-12, 2018. 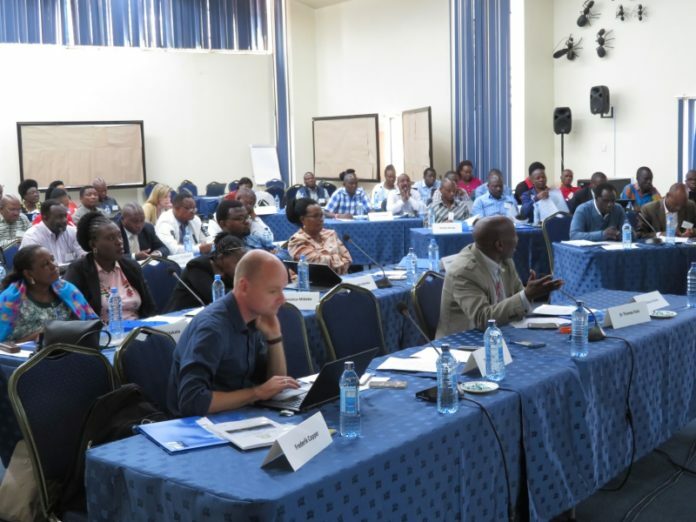 It kicked off the preparation for a cross-border field simulation exercise in Namanga in June 2019. “The EAC Secretariat will convene the exercise under the directive of the Sectoral Council of Ministers of Ministers of Health”, says Andrew Charles, EAC Health Department. The simulation will take place around the One Stop Border Post between Kenya and Tanzania and involve the EAC Partner States of Burundi, Rwanda, South Sudan and Uganda. It will be facilitated by WHO as the lead agency and stage a One Health scenario that involves different sectors of society. The approach above includes all stakeholders which are affected by an outbreak or can contribute to preparedness, response and mitigation. It reflects the fact that most outbreaks are of a zoonotic nature meaning that they can be transmitted between humans and animals. The exercise is being planned at a time where the region is under threat of the current Ebola virus disease outbreak close to the border with Uganda. By 9 October 2018 the number of cases was at 188 and 119 people had died of the disease. Stakeholders from various sectors in Kenya and Tanzania as well as from regional and international organisations participated in the meeting including agriculture and livestock, trade, tourism, environment, the border post and airports, immigration, business, military and police forces. Furthermore, there were representatives from the Namanga community, farmers, traders and religious leaders. The EAC Secretariat urged participants to prepare for the field simulation exercise through sensitization on existing contingency plans and training of staff on the ground and to contribute to mobilising the necessary resources for pandemic preparedness. Next articleWho will save Mount Elgon?